The light and luscious spring-summer flavors of raspberry and lemon are combined in these delicious, easy-to-make muffins. 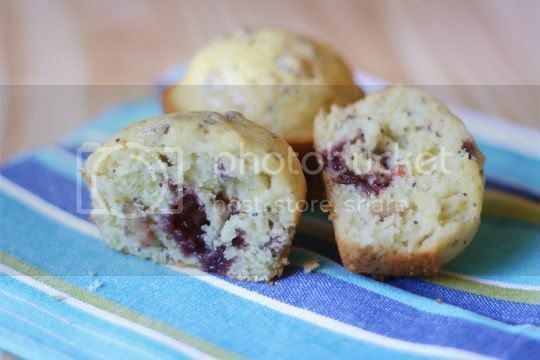 I was actually expecting more raspberry flavor from this recipe (given that "raspberry" is in the title); instead, the muffins are surprisingly lemony and tangy with a wonderful raspberry "surprise" in the middle(not that that's a bad thing!). So while the recipe is pretty straightforward, there are some suggestions and words of warning I have. Suprisingly, I did get a full 18 muffins out of the batter (as the recipe says). I dropped rounded tablespoons of batter into the tins (as directed), but a better direction may be to make sure the batter reaches up at least 1/2 inch on the sides. If you have too little batter, the raspberry preserves will leak out in a hole at the bottom. 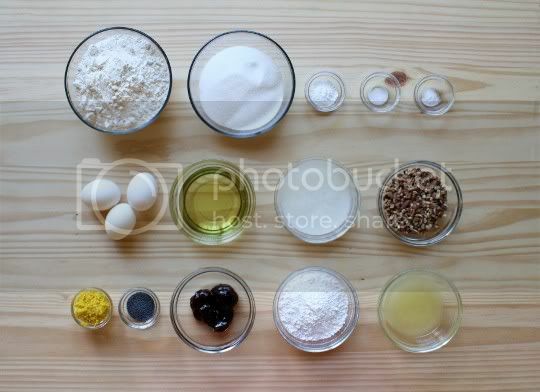 Speaking of the preserves: you'll need a bit more, maybe an extra tablespoon, to fill all of the muffins. The recipe says use about 1/2 teaspoon for each muffin, but I actually found myself wanting more in the finished muffin. It's such a delicious surprise! The glaze that's brushed on when the muffins come out of the oven (yes, brushed on, not drizzled as suggested) is so yummy. 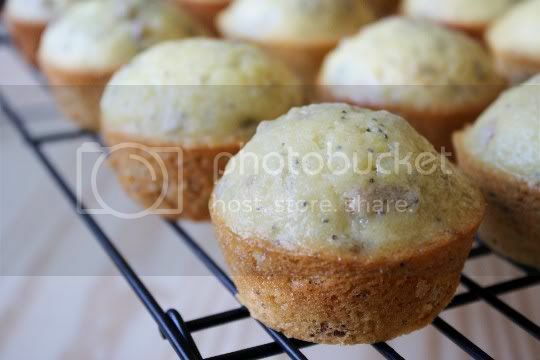 It's super tangy, which cuts some of the sweetness of the muffins, and increases the lemon flavor tenfold. The amount of glaze, however, is entirely too much for the recipe. You can definitely halve it; in fact, you may even want to adjust the amounts a bit to make it thicker, since it's pretty thin made as-is. My only complaint about these muffins is the inclusion of nuts in the batter. They seem awfully out of place for a recipe such as this one, where lightness and light flavors should be emphasized. The nuts just add unnecessary crunch and almost a heaviness to the muffins which is totally unexpected. I'd suggest leaving them out of the batter, unless you're just a nut fiend and won't mind them. Make again? Definitely...without the nuts! Vegan variation: Use egg replacer and a buttermilk substitute.